Watch this wild Mustang wheelie, and win! It’s a safe bet drag racer J.R. Pines will never forget the debut race with his new Ford Mustang. 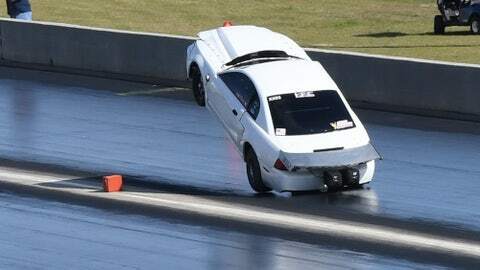 Pines, 28, from New Orleans, La., participates in drag radial competition; a specialty type of drag racing which combines the best of both worlds in street and strip performance. Sunday morning at the Lights Out 8 Drag Radial event in South Georgia Motorsports Park, outside of Valdosta, Ga., Pines got a bit more performance than he anticipated. In the first round of eliminations, Pines’ scored an unlikely victory while going through the finish line on the back wheels of his race car. Race officials initially disqualified Pines suggesting his car had crossed the centerline, and striking one of the foam timing blocks affixed to the track. Video replays showed it was the wind from the odd positioning of the race car, which crossed the finish line at 120 mph, that dislodged the block from its mounting, and thus handing Pines the odd victory. “When the front-end started to come up, I figured the best thing to do was just to feather the throttle,” Pines explained. The more Pines feathered the more altitude the Ford Mustang gained. In many instances where certain race cars tend to pull the wheels in the air, a device called a wheelie bar is often attached to the rear of the car to save it from flipping over backward. Pines says it isn’t a matter of being macho, rules in the Outlaw Drag Radial classifications prohibit the safety device. Fortunately the car remained more grounded in round two, but unfortunately he was beaten.